Nepal is among the poorest countries in the world like Bangladesh, Bhutan, Cambodia, Ethiopia, Gambia, Haiti, Uganda, Tanzania, Vanuatu, Yemen, and Zambia. Nepal's annual economic growth rate is less than 2 percent. 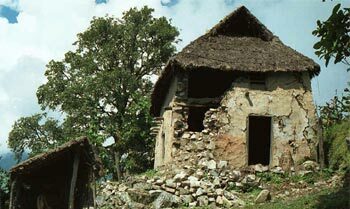 According to CIA World Fact book, March 2005, Nepal is the 48th poorest country in the world. Nepal borders China (Tibet) to the north and is surrounded by India on its other borders. Only 21% of the country is under cultivation. Nepal is a land-locked country located more than 1000 km from Calcutta, India, its most important port. Nepal’s population in terms of race and language can be divided into two main groups: the Aryans, an Indo-European speaking group, and the Mongolian Tibetan-Burmese speaking ethnic groups. Nepali, a language originating from Sanskrit, is the mother tongue of about 60% of the population. About one quarter speak Newari and the remainder speak other other languages such as Hindi, Urdu and Maithili. The majority of the population is Hindu, the state religion. Other denominations include Buddhists. Nepal’s population is estimated at approximately 24 million with an annual growth rate of about 2.2%. At least 40% of the population are under the age of 15. Even with a declining population growth rate, it is estimated that Nepal’s population will reach 30 million by 2010. 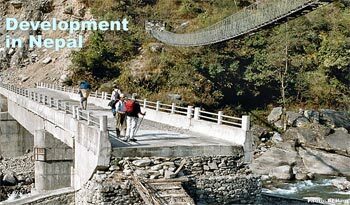 Nepal is one of the group of countries classified by the UN as least developed. With a GNP per inhabitant of US $210, Nepal is one of the world’s poorest countries. No clear documentation on absolute poverty in Nepal is available and figures vary, depending on calculation methodology, from 40-71% of the population. Social development remains at a very low level. Infant mortality is 96 per 1000 live births and average life expectancy is 55 years of age for men and 54 years of age for women. Only 30-40% of the population can read and write (40-50% of men and 15-20% of women). Nepal's half the population live below the poverty line, and about one third of the population lives without clear water. These are people who do not have access to basic needs such as food, health and education. Half the children are malnourished and under weight. Half the people are jobless in Nepal. Average income of Nepal is less than $200 a year. About 15% of the Nepalese have access to health services. Nearly half the children's in Nepal are under weight. Nepal's most of the poor people live in rural areas yet still a huge percentage of poor people struggle in cities trying to make ends meet. About 80% of Nepalese are farmers. Life in Villages: Youth have left their homes or have joined the rebels or have been killed in the civil war between the rebels and the government. Most villages are empty, what ever they have are the old and sick parents unable to make it to the city, and trying to survive the best they can. Kids spend most of their daily life doing house-hold works. Because of the civil war, Nepal's beautiful villages with magnificent mountains and landscape are as empty as ghost town. Life in cities : Those flocked to the cities without financial support end up begging on the streets or find job as a servant taking upon house-hold works of a family in return for food and a shelter. Most poor people including kids in cities work as a servant, dishwasher, bus conductor, porter, painter, waiter/server, and helper in many construction works such as house construction. Those with a little bit of financial support from parents will try to get a job while going to a government college. Most students living in cities like Kathmandu work while they study. In city, living cost is extremely high, and poor to mid-class family struggle to pay off bills such as house rent, food, transportation, phone, water, and electricity. The most popular business in city is opening a convenient shop, easy to start - rent a room, pack it with groceries, and open it. The second most popular business is building a house with lots of rooms for rent - in fact people build their houses with extra rooms for others to rent. Most Nepalese live on a $1 day or less! Did you know that? Rain is very important to Nepal's economy. Country's 80% of people are into agriculture. Often when there is no rain farmers worship the Lord Indra - the mythical Hindu god of rain. 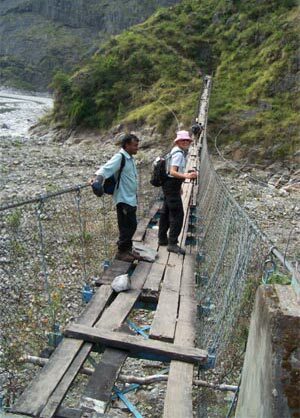 Bandhs have kept much of Nepal’s countryside paralyzed, causing severe poverty and hardship.